1 NAIRABET AMERICAN FOOTBALL American football which is also called the NHL is played on a 100-yard long field, with goal lines on each end. The field is marked in increments of one yard. The main objective is to score more points than your opponent, as it is with most games, in the time allotted to do so. This game as it is played is mainly a battle of territory gained or lost by 11 people on each team, much like war! There is an offense and a defense. Both entities are usually separated on the rosters by designated positions. The main scoring occurs if either team crosses the opponent's goal line, by running the ball across, or by throwing it to a teammate who catches the ball, not allowing it to touch the ground until firmly in possession of the ball. This is called a touchdown and is rewarded by six points. After every touchdown, a team is given the option of adding on 1 point, by a kick through the uprights, or goalposts. A team can also try for two points by placing the ball three yards behind the goal line, and scoring across the goal again. Secondary scoring includes field goals, where the ball is kicked through the uprights, or goalposts, anywhere on the field of play where the team possesses the ball, which results in three points. 2 The only other way to score is when the defense traps the opponent in its own end zone, or scoring zone, which results in what is called a safety, for one point. 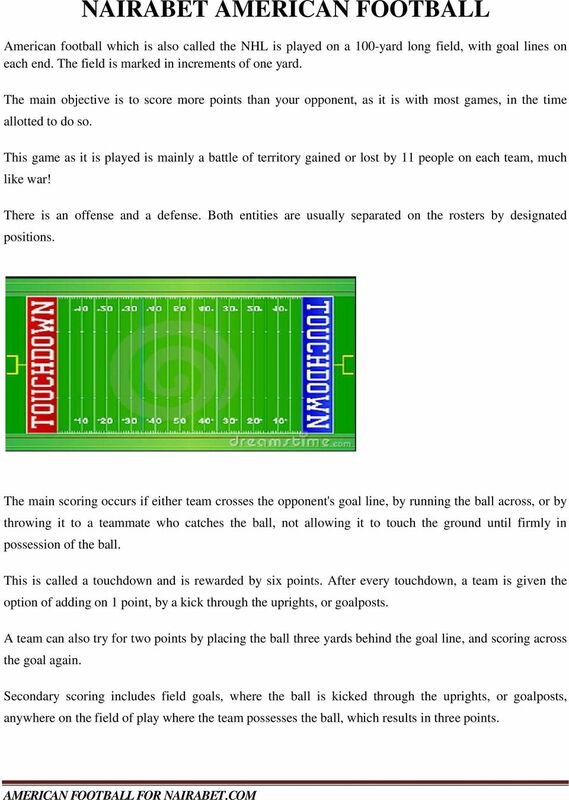 The team that gets caught in their own end zone then must kick the ball back to the opponent. Let s name all the positions that the players are called, with a brief explanation of duties. 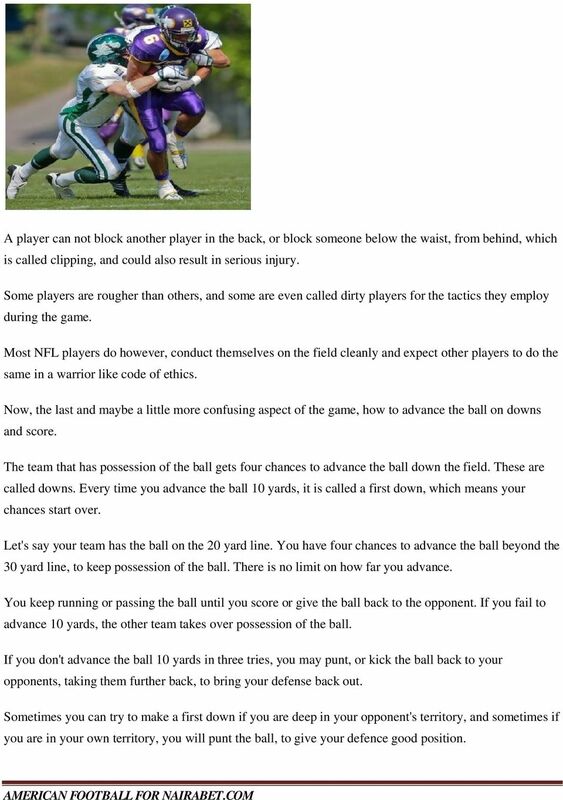 BASICS The purpose of the game is to move the ball towards, and ultimately into, the opposition's end zone. This is achieved by either running with the ball until tackled, or throwing the ball downfield to a team-mate. 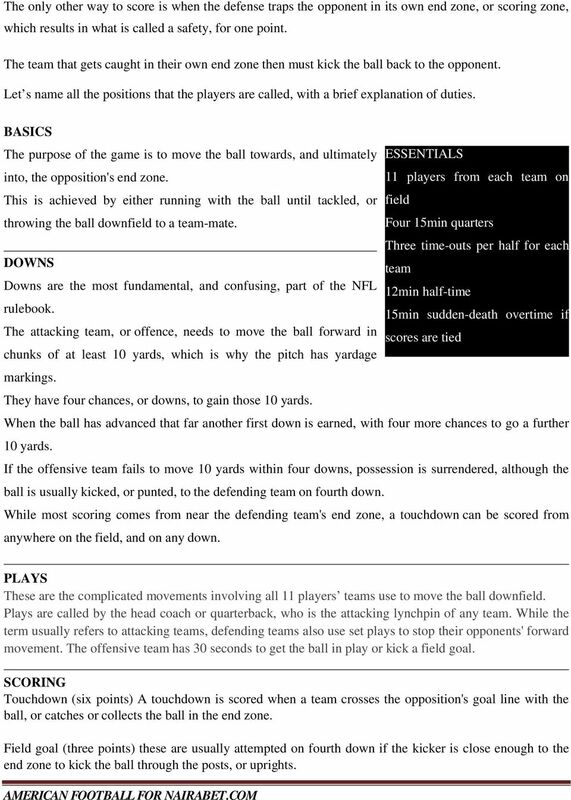 DOWNS Downs are the most fundamental, and confusing, part of the NFL rulebook. The attacking team, or offence, needs to move the ball forward in chunks of at least 10 yards, which is why the pitch has yardage markings. They have four chances, or downs, to gain those 10 yards. ESSENTIALS 11 players from each team on field Four 15min quarters Three time-outs per half for each team 12min half-time 15min sudden-death overtime if scores are tied When the ball has advanced that far another first down is earned, with four more chances to go a further 10 yards. If the offensive team fails to move 10 yards within four downs, possession is surrendered, although the ball is usually kicked, or punted, to the defending team on fourth down. While most scoring comes from near the defending team's end zone, a touchdown can be scored from anywhere on the field, and on any down. PLAYS These are the complicated movements involving all 11 players teams use to move the ball downfield. 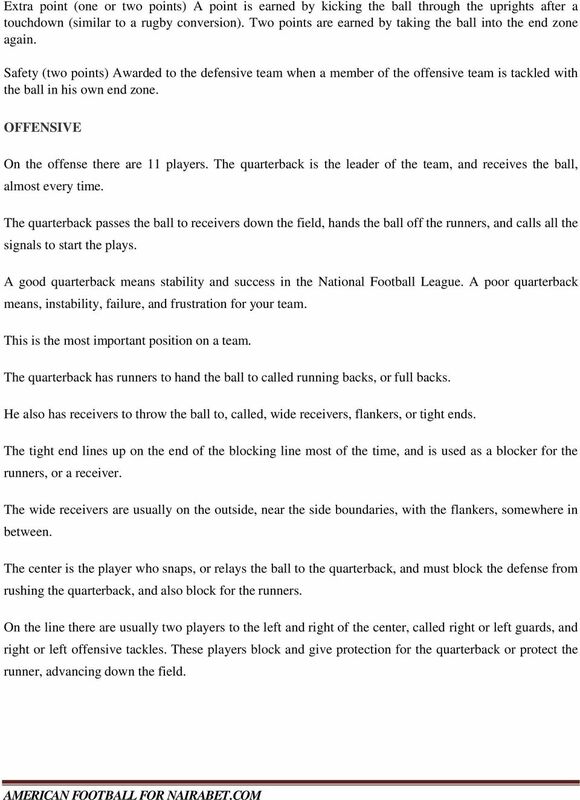 Plays are called by the head coach or quarterback, who is the attacking lynchpin of any team. While the term usually refers to attacking teams, defending teams also use set plays to stop their opponents' forward movement. The offensive team has 30 seconds to get the ball in play or kick a field goal. SCORING Touchdown (six points) A touchdown is scored when a team crosses the opposition's goal line with the ball, or catches or collects the ball in the end zone. Field goal (three points) these are usually attempted on fourth down if the kicker is close enough to the end zone to kick the ball through the posts, or uprights. 3 Extra point (one or two points) A point is earned by kicking the ball through the uprights after a touchdown (similar to a rugby conversion). Two points are earned by taking the ball into the end zone again. Safety (two points) Awarded to the defensive team when a member of the offensive team is tackled with the ball in his own end zone. OFFENSIVE On the offense there are 11 players. The quarterback is the leader of the team, and receives the ball, almost every time. The quarterback passes the ball to receivers down the field, hands the ball off the runners, and calls all the signals to start the plays. A good quarterback means stability and success in the National Football League. A poor quarterback means, instability, failure, and frustration for your team. This is the most important position on a team. The quarterback has runners to hand the ball to called running backs, or full backs. He also has receivers to throw the ball to, called, wide receivers, flankers, or tight ends. The tight end lines up on the end of the blocking line most of the time, and is used as a blocker for the runners, or a receiver. The wide receivers are usually on the outside, near the side boundaries, with the flankers, somewhere in between. The center is the player who snaps, or relays the ball to the quarterback, and must block the defense from rushing the quarterback, and also block for the runners. On the line there are usually two players to the left and right of the center, called right or left guards, and right or left offensive tackles. These players block and give protection for the quarterback or protect the runner, advancing down the field. 4 DEFENSIVE. First we have the defensive linemen. They are called defensive ends and defensive tackles, their job is to rush the quarterback, tackling him with the ball if possible, called a sack, or tackling the runners trying to advance down the field. The players directly behind the defensive linemen are called linebackers. They of course back up the linemen, helping with tackles and rushing the quarterback, as well as defending against short passes, mainly. There are three of these players, called an outside linebacker, lining up on the outsides of the line, back a bit, or the middle linebacker, who positions himself, basically in the center of the field, behind the linemen a bit. The middle linebacker usually calls out to the defense, what to expect or defend against, also known as the defensive signals. He is often the defensive team captain. The defensive backs defend against the pass receivers, in a zone coverage where they defend a certain area or man to man, where they try to stay step for step with one particular player. There is one last position called a safety on defense, which can be used to defend, passes, runs or attack the quarterback. Sometimes the defense will line up with three linemen, and four linebackers, called a three/four defense and other times they line up with four lineman and three linebackers, which is called a four /three defensive set. This is determined by the offense's ability to throw the ball, or run better. 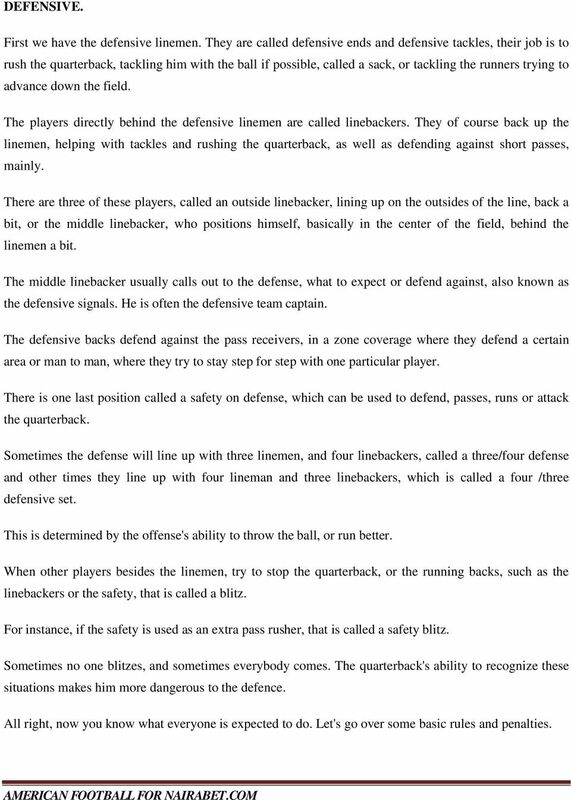 When other players besides the linemen, try to stop the quarterback, or the running backs, such as the linebackers or the safety, that is called a blitz. For instance, if the safety is used as an extra pass rusher, that is called a safety blitz. Sometimes no one blitzes, and sometimes everybody comes. The quarterback's ability to recognize these situations makes him more dangerous to the defence. All right, now you know what everyone is expected to do. Let's go over some basic rules and penalties. 5 A player can not block another player in the back, or block someone below the waist, from behind, which is called clipping, and could also result in serious injury. Some players are rougher than others, and some are even called dirty players for the tactics they employ during the game. Most NFL players do however, conduct themselves on the field cleanly and expect other players to do the same in a warrior like code of ethics. Now, the last and maybe a little more confusing aspect of the game, how to advance the ball on downs and score. The team that has possession of the ball gets four chances to advance the ball down the field. These are called downs. Every time you advance the ball 10 yards, it is called a first down, which means your chances start over. Let's say your team has the ball on the 20 yard line. You have four chances to advance the ball beyond the 30 yard line, to keep possession of the ball. There is no limit on how far you advance. You keep running or passing the ball until you score or give the ball back to the opponent. If you fail to advance 10 yards, the other team takes over possession of the ball. If you don't advance the ball 10 yards in three tries, you may punt, or kick the ball back to your opponents, taking them further back, to bring your defense back out. Sometimes you can try to make a first down if you are deep in your opponent's territory, and sometimes if you are in your own territory, you will punt the ball, to give your defence good position. 7 Halftime/full time means you are predicting what the result of the game would be at the 1 st 2 quarters and what the outcome of the same game would be at whole 4 quarters. MOST SCORING QUARTER Most Scoring Quarter means you are predicting the Quarter that will have the highest point TOTAL POINTS-ODD/EVEN & TOTAL POINTS IN 1 ST HALF-ODD/EVEN ODD/EVEN: This means you are predicting the total points in the game will be an odd or even.odd number include 1,3,5,13,15,31 etc while Even is 0,2,4,6,12,18,20,22,40 etc. 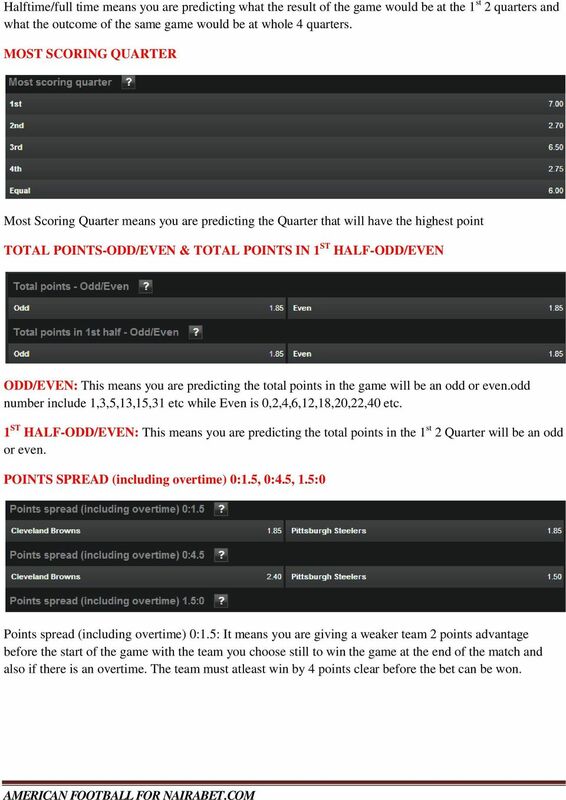 1 ST HALF-ODD/EVEN: This means you are predicting the total points in the 1 st 2 Quarter will be an odd or even. 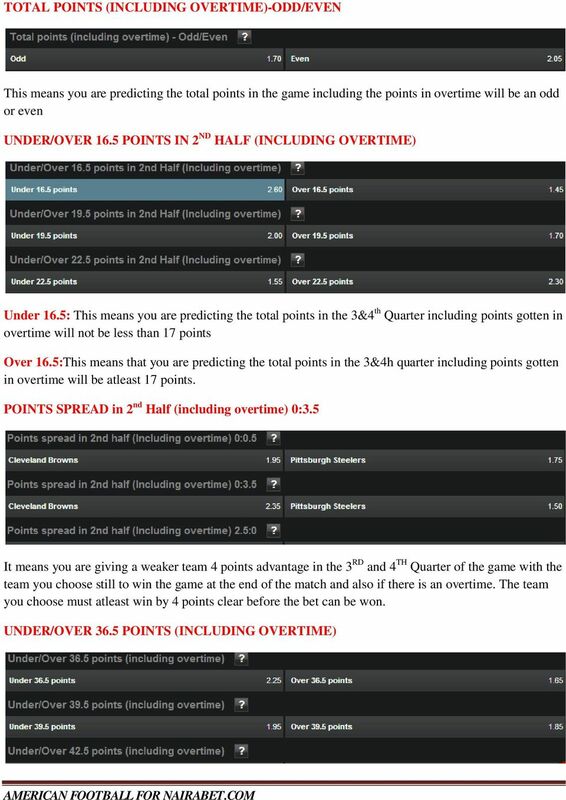 POINTS SPREAD (including overtime) 0:1.5, 0:4.5, 1.5:0 Points spread (including overtime) 0:1.5: It means you are giving a weaker team 2 points advantage before the start of the game with the team you choose still to win the game at the end of the match and also if there is an overtime. The team must atleast win by 4 points clear before the bet can be won. 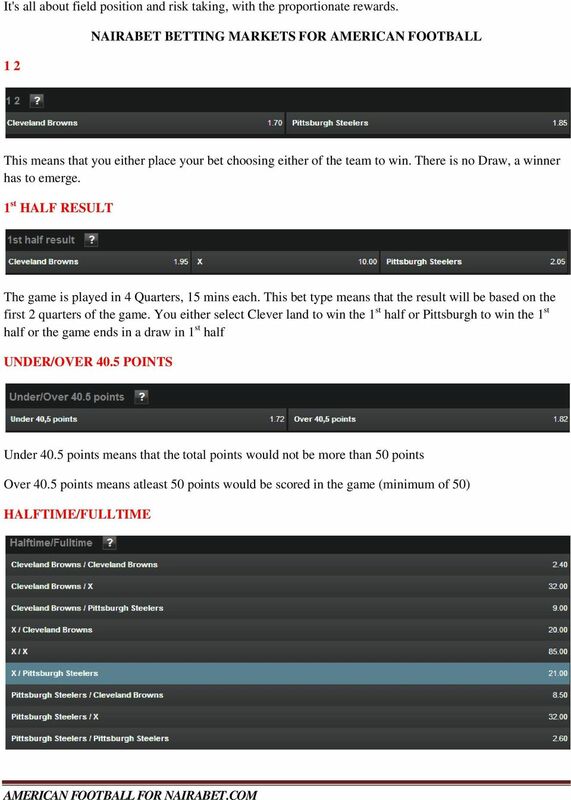 9 Under 36.5: This means you are predicting the total points in the whole game including points gotten in overtime will not be less than 37 points Over 16.5: This means that you are predicting the total points in the whole game including points gotten in overtime will be atleast 37points. OVERTIME YES/NO This means you want to predict that the game will end in an Overtime when you select YES or there won t be an overtime when you select NO. Detroit is proposing to be able to challenge all fouls, from offensive holding, any foul that takes place, they re proposing should be reviewable.